A tree dedication thanks to Sempervirens Fund efforts. 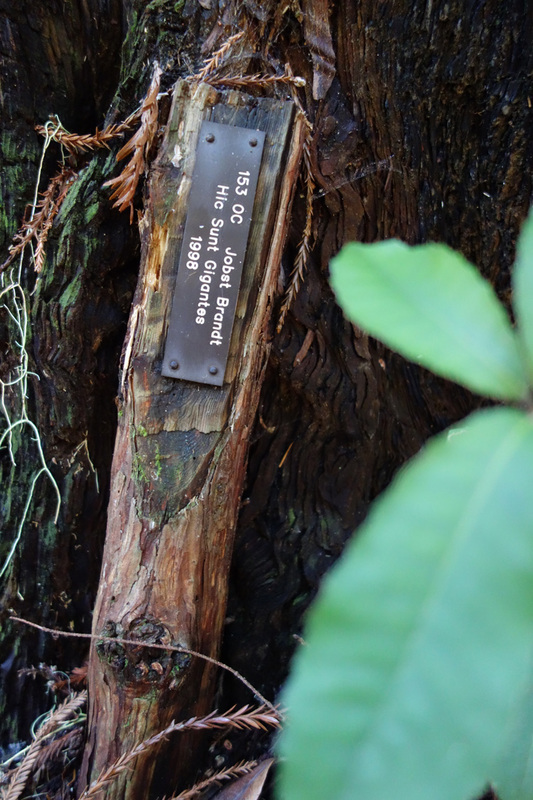 In 1998 I dedicated a redwood tree located in Big Basin State Park to Jobst Brandt. It was done through a fund-raising effort created by the Sempervirens Fund and backed by the park. After all these years I finally had a chance to stop by and see the tree. Jobst led many rides through the park starting in the early 1960s, notably Gazos Creek Road, but he also visited more remote locations in and around the park. Jobst fondly remembered the time he drove his car with his wife Helga on Gazos Creek Road back in the 1960s before the dirt road was closed to traffic. That must have been some drive. Of course these days the road is closed to cars, although the rangers still drive their trucks on it for routine maintenance. The tree is located about fifty yards southwest of the Barnes Kiosk on North Escape Road at Opal Creek. It’s a medium-sized redwood in the grove, but still a fitting tribute to Jobst, who loved taking North Escape Road on his way to Gazos Creek Road. My dedicated tree isn’t the only one in Jobst’s name. 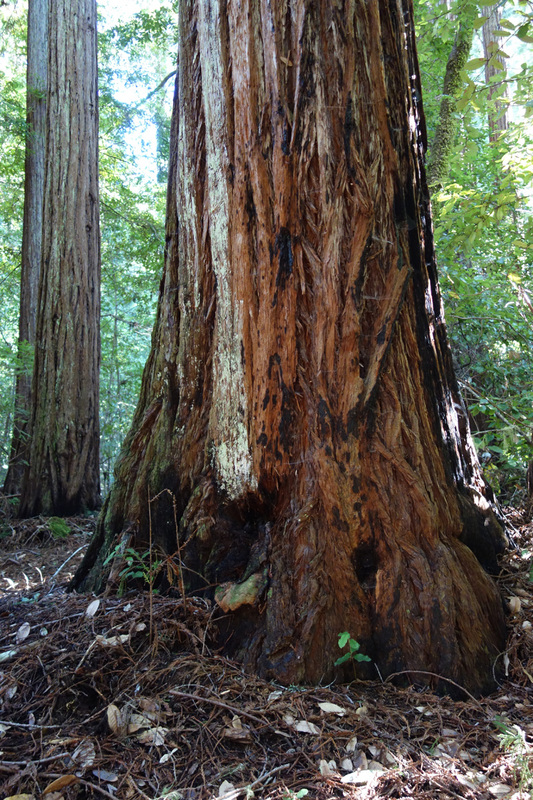 Sempervirens Fund, located in Los Altos, is the state’s oldest land trust. Photographer Andrew P. Hill was instrumental in the organization’s founding, which ultimately led to the establishment of Big Basin Park by the state of California in 1902. Andrew pushed for the park based on an all-too-familiar incident that still goes on today. A landowner accused Andrew of trespassing while he was out taking photos one day in the Santa Cruz Mountains. Andrew and Jobst had a lot in common there. It’s a big reason why Jobst gave generously to Sempervirens, POST, and Save the Redwoods. I’m not sure what was going on this Sunday, but hikers filled the parks. Castle Rock and Big Basin had full parking lots. Maybe it’s the “New Year’s resolution” effect. On my way home I discovered I had only 65 cents and had forgotten to bring food. I stopped in at the gas station at Hwy 9 and Hwy 236 in Boulder Creek to see what pennies would buy. These days, not much. A Tootsie Pop goes for 19 cents. Such a deal. It was fuel enough for the long climb up Bear Creek Road, Summit Road and home on Skyline. My Jobst Redwood is just off North Escape Road at Opal Creek. This entry was posted on January 11, 2015 at 7:30 pm and is filed under Ride reports. You can follow any responses to this entry through the RSS 2.0 feed. You can leave a response, or trackback from your own site.